The Jaguar XE SV Project 8 has set a new record, this time at WeatherTech Raceway Laguna Seca. The XE SV Project 8 features a 5.0-liter supercharged V8 with 592 horsepower and 516 lb-ft. of torque. At nearly $200,000 is this actually worth it? Other cars make similar track numbers and cost much less. 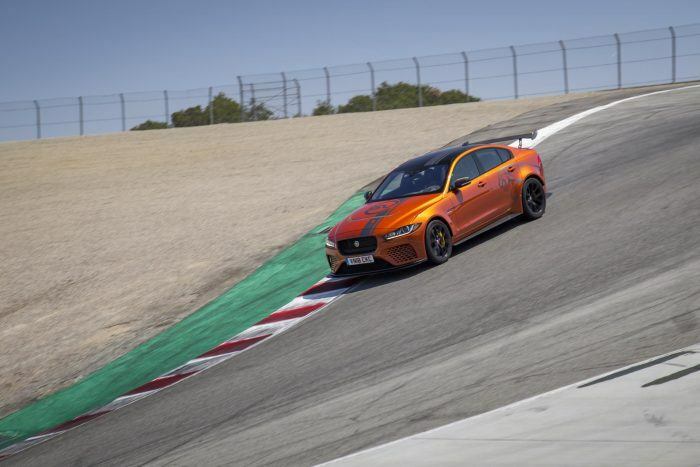 Jaguar is trucking their big, bad XE SV Project 8 sedan to tracks around the world and letting it smash old lap records to dust. The latest victim, er, stage is the glorious Laguna Seca just south of San Francisco. Jaguar says the XE SV Project 8 is “supercar-rivaling” and in a lot of ways, they aren’t far off the mark. So how fast did the latest big cat sedan go? Very. Thus far, on a number of other tracks, the big Jag rightfully claims to be the world’s fastest four-door car. And cracking off a number like seven minutes, 21.23 seconds at the Nürburgring Nordschleife means I’m not going to argue the point much. Of course, people like BMW and Audi and Alfa Romeo might. But we’ll have to save those fun arguments for another time. Or, at least until BMW, Audi, and Alfa Romeo etc. start putting their own lap times on the leader board. Jaguar says the XE SV Project 8 is the most extreme Jaguar yet. Not Jag sedan, just “the most extreme Jaguar” period. Which is saying a lot. And, with that time at the ‘ring, which is around what a Ferrari 488GTB can turn, I’m not going to say they’re talking out of school with this stuff. So what’d she do down at Laguna anyway? 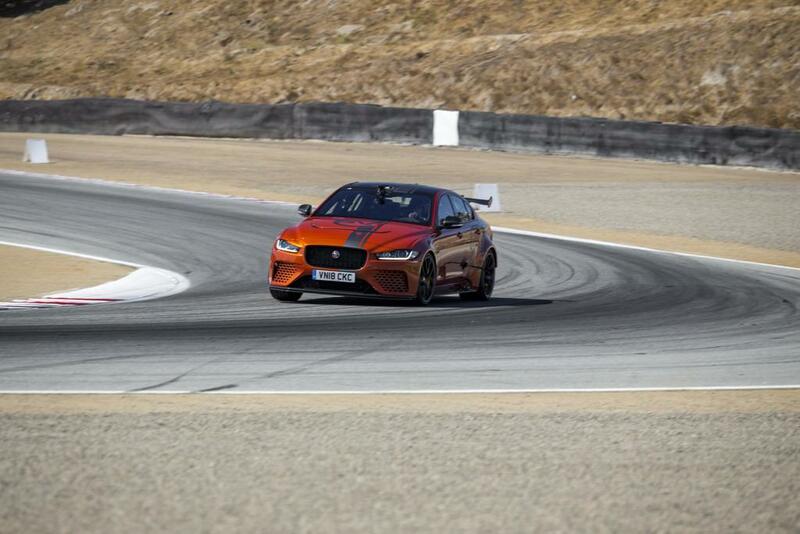 With North American Touring Car Champion Randy Pobst at the helm, the Jaguar XE SV Project 8 turned a 1 minute 37.54 second time at the 2.238-mile Laguna Seca. But, with a driver like that at the controls, 600 horsepower on tap, and a 200 mph top speed, it’s easy to see how this was going to shake out. Jag says the new numbers are almost a second faster than any previous production sedan record. This includes cars like the Cadillac CTS V, Alfa Romeo Quadrifoglio, and the Mercedes-AMG C63 S Sedan. In case you’re wondering, that’s also just as fast as Nissan GT-Rs, Porsche Cayman GT4s, BMW M4 GTSs, Chevy Camaro SS 1LEs, and Porsche 911 Turbos. All have turned times in the 37s. So yeah, this Jag is plenty fast. The XE SV Project 8 sedan is an all-wheel drive beast of a car, featuring F1-style ceramic wheel bearings with adjustable ride height and camber. The front and rear fenders are widened to accommodate the bigger wheels and brakes. The wheels are wrapped in Michelin Pilot Sport Cup 2 tires. The transmission is an eight-speed Quickshift automatic ZF piece. The whole shee-bang hits 60 mph in 3.3 seconds, topping out at an electronically-limited (boo!) speed of 200 mph. At the flip of a switch, there’s a Track mode for maximum downforce and damping, and throttle and steering response. As it turns out, there’s two specifications available. The standard four-seat model with the latest magnesium framed front performance seats, and the optional two-seat Track Pack version. That one includes lightweight carbon fiber racing seats, four-point harnesses, and a harness retention hoop in place of the rear seat. All this can be yours for the low, low price of . . . holy! The Project 8 is priced from £149,995 in the UK. That’s just shy of 200-large in good old greenback dollas. That is much, much more than a Nissan GT-R, Porsche Cayman GT4, BMW M4 GTS, and such. I mean, sure, you get to say you’re just as quick in a sedan (and a Jag sedan at that) but still. For $200,000 you could probably get a Porsche Cayman GT4 and a Nissan GT-R so really, what are we talking about here? Your money, that’s what we’re talking about. You’re more than free to go and wast-er, spend it any way you see fit, pal. Each XE SV Project 8 is hand-built at the SV Technical Centre in Coventry. The total production run is just 300 cars. 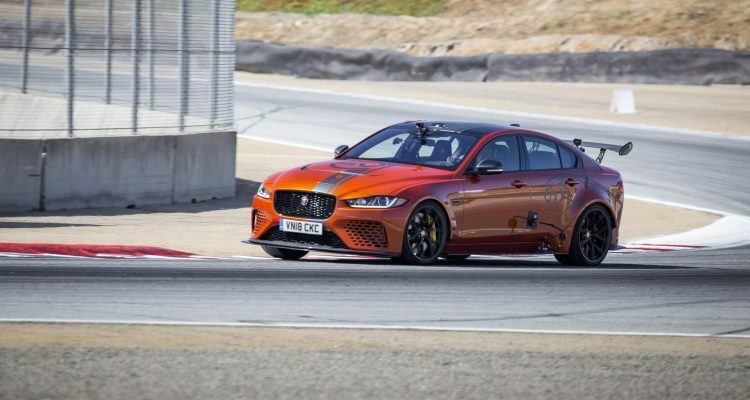 No Comments on "Jaguar XE SV Project 8 Sets Another Speed Record"